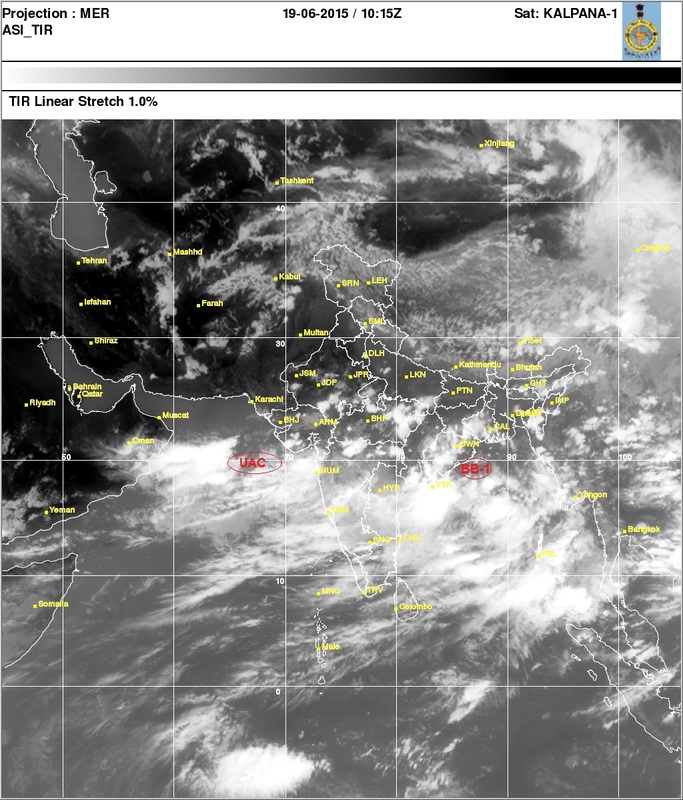 South West Monsoon Advances into Complete Maharashtra, South M.P. Chattisgarh, Odisha and West Bengal (Kolkata) on 19th June. Cool Friday, with the day high seeing 26c, Mumbai showers eased out by night as mentioned in our Friday morning Forecast, and the 12 hrs rainfall for Mumbai averaged 106 mms (Estimated 90 mms by Vagaries). SantaCruz saw 136 mms and Colaba 106 mms in the 12 hs period. BB-1, Located off the Odisha Coast at 994 mb on Friday, will deepen to 992 mb by Saturday and cross the Odisha coast on Saturday night. Heavy rains expected on Saturday night and Sunday in Coastal A.P. South Chattisgarh (Raipur on Sunday) and Eastern Vidarbh (Nagpur, Chandrapur and Wardha). 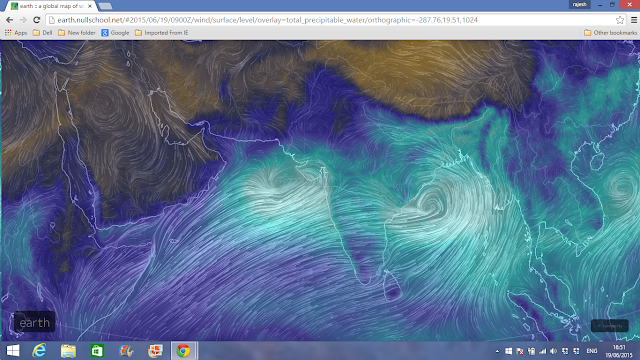 The Low in the Arabian Sea, at 996 mb , is currently South off the Gujarat coast. Likely to get better organised to around 992 mb and remain practically stationary next 24 hrs. As it develops, Coastal Sindh ( including Karachi) can get some rain on Sunday. The wind chart (2 pm IST Friday) shows the effect of the UAC at 700 levels on both sides.BB-1 at upper level and the Upper Level trough, or the upper level Monsoon axis explained in our earlier post.The upper axis is clearly seen. Vihar 223 mms, Tulsi 191 mms, Vaitarna 5 mms,Upper Vaitarna 8 mms, Bhatsa 15 mms, Tansa 9 mms and Modak Sagar 6 mms. Started raining heavily in Parel since 5 PM again. Why there is so much difference between Vihar vs vaitarna that means we had little rain near kasara? Now IMD has updated weather report- red color code = for extreme heavy falls over konkan. Next few days Orissa/Central India/GUJ will be in heavy news spells post bay low + MAHA already in extreme catg. 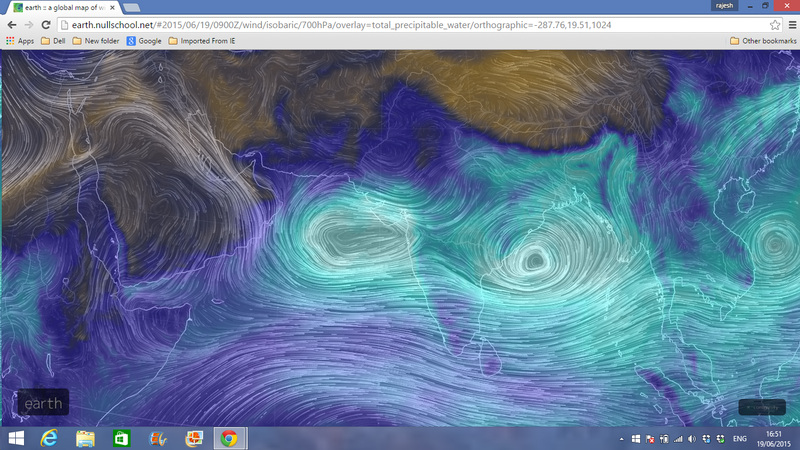 But IMD says next 48hrs low forms over GUJ - so what implication on MUMBAI/MAHA??? Rajesh sir is this what we call a sympathy wave or sympathy low ?? Similar go what happened in somewhere July 2014 in mumbai? After 40 hours of pounding, rains finally take a break here in Mira Road,North Mumbai. Rain break over...very heavy rains since past 20 minutes here in Mira Road, North Mumbai. Khyati. . The UAC had become s low. Initially weak. It was a uac till now. Why rains not pouring in lakes? As is seen from the Upper air flow of Friday, most rains are concentrated along North Konkan coast. Thats why i tried to explain with wind chart. There is very low rainfall inland. Will improve with BB-1 advancing and crossing coast. A Low, or winds which rush along the same latitude as a system in the Bay, is called a sympathy low in the Arabian sea. The current Low is not in sympathy with the BB-1 system. It has formed from an upper air trough. Thanks sir for clarification . I had been under impression this is sympathy low.. Started Pouring in Central Mumbai since 1 PM. Will the low off Gujarat coast move eastwards towards coast or westwards? Rajesh, I am a bit of a layman on weather terms. What is the difference between a UAC and BB ? Sir till how many days Mumbai would go through rainy days due to the Arabian as well as bb1 depression.